Those of you who have been paying close attention over the last few weeks, will recognise the name Trials. I did an interview with Mark and Usha from the Chicago metallers earlier in the year and thought it was time that I posted up my review of their new album. 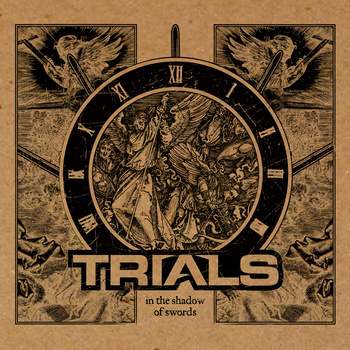 In The Shadow of Swords is Trials second album, having already released Witness To The Downfall back in 2011. Trials play a modern take on metal, with death and thrash thrown in alongside the obligatory groove. Note: The digital version of the album includes a cover of Judas Priest song Jawbreaker, whereas the CD version contains the track Spirit Leaves. I'm reviewing the digital version. It seems like an age since I actually listened to some proper modern metal. All these sub-genres can get mystifying, so sometimes it's good to sit back and listen to something more familiar. Trials are modern metal of the best kind for me. Their mixture of death, thrash and groove sits really well alongside the melodic choruses and subtle djent influences. Conjoined is an epic call to arms as well, featuring elements of all of the above. The deeper you get into Conjoined, the more you hear symphonic elements too. Believers In Black hints at the rock n roll swagger of the band and definitely highlights why Trials were chosen to support Holy Grail in July. There is a progressive edge to the band as well though. Their songs are longer than those of your average metal band, but their musicality and skill justifies it. Trials keep up a pretty blinding pace without sounding fast. Their groove and song-structure lends itself to a full-throttle assault. There are similarities between Trials and Scandinavian progressive metallers Scar Symmetry that reveal themselves during cleanly sung passages (to my ears anyway!). The pace does slow slightly during fourth track In The Misery Machine, but it doesn't spoil the bands momentum and it creates a slightly more brooding atmosphere too. That brooding atmosphere continues into fifth song With Only Sorrow Now. It's extended instrumental intro providing a neck snapping groove and a sound, which will definitely prick your ears up. As you pass the halfway and point and get stuck into All The Promises, the variation begins to kick in more, with subtle time-signature changes and more experimentation. This is where Trials begin to flex their musical muscles after the initial full-on assault during the first half of the album. Their ballad moment comes in the form of Upon This Day. It's a pretty majestic one though and the further in you get, the more that ballad tag becomes irrelevant. Penultimate song Embracing Nothing is a rage too and their longest song. After that, they pluck out an unlikely cover in the form of Judas Priest song Jawbreaker. It gives the album a rousing send off and shows that Trial are not afraid to put their stamp on a classic. 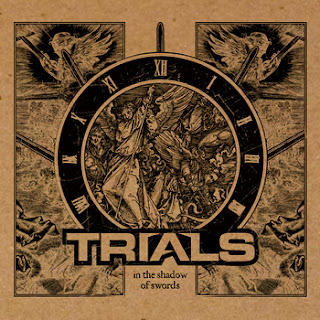 Trials play some of the best modern metal I've heard since I reviewed A Wanted Awakening. It reminds me of my early days discovering metal bands and listening to metalcore (when it was good!). It's just honest, killer modern metal that will gain Trials new fans without a doubt. You should check it out. In The Shadows of Swords is available to buy both digitally and on CD from the Bandcamp page above.